Produce of JSС "Kombinat "Vostok"
Along with traditional tomatoes, cucumbers, an onions, garlic, a potato, a beet, cabbage and carrots, the industrial complex grows up less characteristic for Belarus cultures. These are vegetable marrows, eggplants, sharp and sweet peppers, a leek and salad onions "Exhibition", a radish, an asparagus and asparagus bean, Peking cabbage, Brussels sprout, Cauliflower, Savoy cabbage , Red cabbage, kohlrabi and broccoli, salads of various kinds, various herbs (fennel, celery, parsley, basil). Also, several years ago began growing watermelons. Industrial complex has mastered growing oyster mushrooms and shiitake mushrooms. 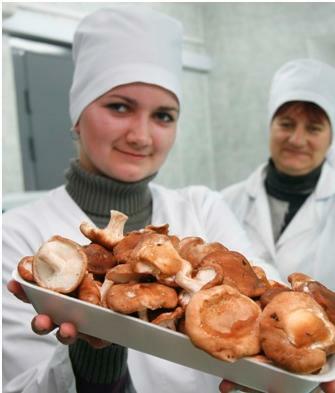 Oyster mushroom is grown in Belarus a lot, but shiitake mushroom are unique and known for contributing to the preservation of youth, beauty and health - not as widely distributed as its production requires a very thorough and careful approach and considerable expenses. In addition to the fresh mushrooms in the stores you can find dried shiitake mushrooms produced by our combine. Industrial Complex "Vostok" under trade mark "Vostochnye gryadki" have more than 20 species of all kinds of canned food - ranging from all kinds of solyankas , appetizers and ending ketchup with mushroom and tomatoes in tomato juice. And in the winter after the harvest, pickles, tomatoes, sauerkraut, pickled garlic, and pickled apples will be appearing in stores. Although the main focus occupation is vegetable production, industrial complex have livestock of cattle for dairy products and special breed cows is grown for production of beef. Also, on-farm plant is grown sheep and horses. Fish and flock of geese get graiced in the pond.